In Tropico players get to take control of El Presidente as he rules his own island nation in a Cold War era. 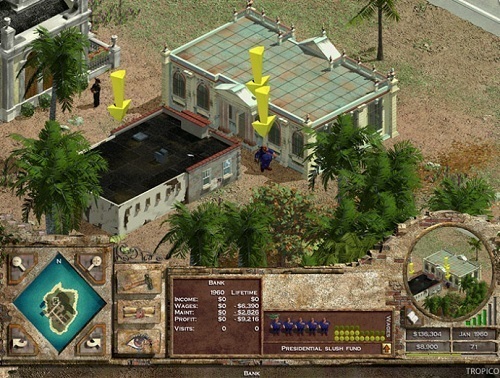 The game is a light hearted city building, management and simulation game that injects humour into a number of its game mechanics. Tropico offers two different game modes for players to control their island nation, scenarios and custom games. In scenarios players are presented with a selection of goals that must be met given the current game conditions. Alternatively players can take to the custom game mode where you can set your own parameters and chase one of several win conditions. One of the best aspects of the custom game mode is the ability to design your own El Presidente which adds another layer of depth to the strategy side of gameplay. You’re unique character can be based on a few real life figures or entirely designed by yourself. Each of these characters can have their own personalities and background story on how they secured power (which changes attitudes of particular factions at the start of the game). Regardless of which game mode you choose one thing remains the same which is the need to maintain your power. Maintaining your power is no easy feat in Tropico with plenty of ways to lose it. This includes your population voting you out, individual factions taking over control, the army itself staging a coup or international superpowers deciding to invade your tiny country. 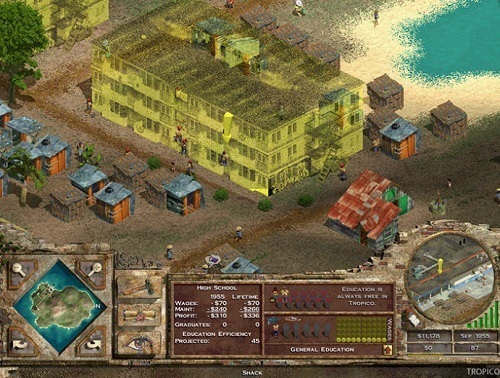 While much of the gameplay in Tropico is about balancing the various relationships in the game world players will also have to oversee the construction of infrastructure and the creation of laws on their island nation. Tropico is a classic in the genre and despite the age of the game it still holds up well against more modern game options. The feeling of running your own island and the humorous undertones make the game what it is. Run an island nation as El Presidente. Construct buildings and introduce new laws into your island. Tackle the scenarios or play in a custom created game instead. A large number of relationships that require careful management.